It is one of those few times when I am still awake after packing off my kids to school. I generally sleep late and wake up too early and try to catch a nap after they leave. Today I decided to finish off some pending blog work and was too tempted to post a recipe. This is a small treat for those of you who will come to check for a new recipe this week 🙂 I know I haven’t been regular with my recipes but in the past couple of weeks I have managed to amass another bunch of new ones that I hope to post in the upcoming days. I have set a weekly target for myself. I just hope I can stick to it. 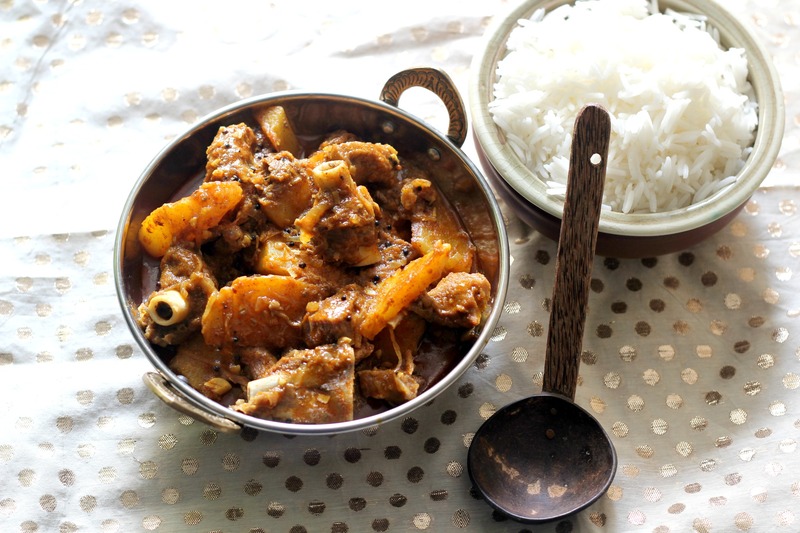 So earlier this week I made this easy mutton curry. I generally grab my favourite cookbooks when it comes to looking for non-vegetarian recipes. If I am not successful in finding one, then I turn to the internet. I try to avoid that unless I know for sure that I won’t be shooting pictures that day and hence blogging that recipe is not a possibility. The reason is that I like to try and share recipes from long lost or almost forgotten cookbooks, especially my own collection of handwritten notes and recipes that belong to my family, something that I have painstakingly curated over the years. I avoid adding one more recycled recipe back on the internet when I could do much more than that. However, I break this rule if I have tried out something incredibly delicious and posting the recipe then becomes non-negotiable. So, this recipe is from one of my favourite authors, Mrs. K.M Mathew who shares some brilliant recipes from Kerala. This was originally called as the ‘Mutton Peralan’ but I modified it too much to suit my tastebuds and ingredients available, so I renamed it as the Kerala Style Easy Mutton Curry. While you’re at it, do save this recipe on your Pinterest boards too! It’s just one click away! A quick and easy recipe for your weekday meals. 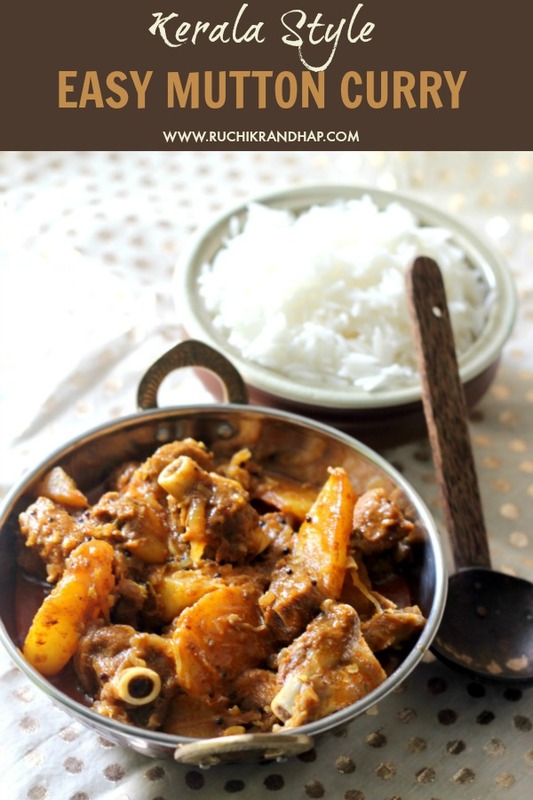 This curry goes very well with rice or chapathis! Apply salt to the potato wedges and keep them aside for 10 minutes. Then shallow fry in a skillet till golden brown on both sides. Heat oil in a heavy, wide based wok/kadai and add the mustard seeds. When they stop spluttering add the ginger & garlic and fry for half a minute. Then add the onions and fry them till they turn translucent. Add the prepared masala paste and fry on a medium low heat for about 2 minutes. Then add the cooked mutton pieces and 2 ladlefuls of the stock. Don't add all the stock in one go. Mix till all the mutton pieces are coated with the masala. Simmer and cook uncovered for 5-7 minutes, adding ladlefuls of the stock in between. Mutton curry looks delicious. Will give it a try and send you a picture. Thanks so much Cynthia! I hope you like it! 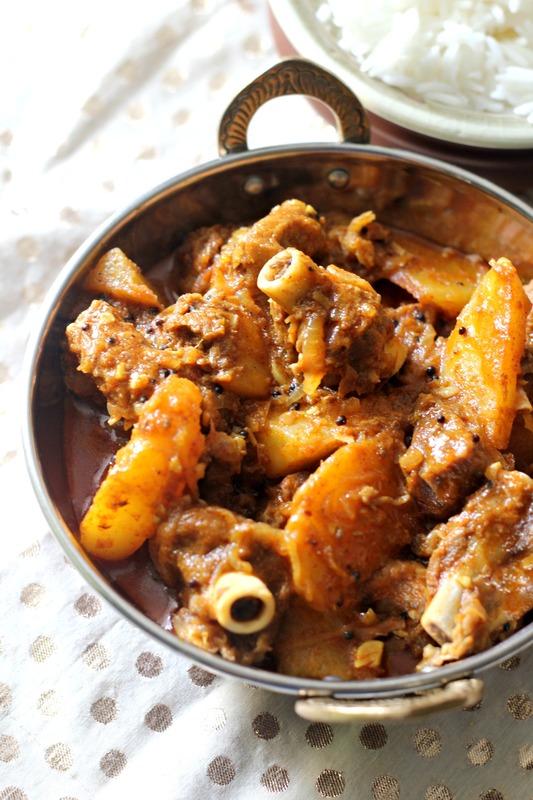 Hi, Shireen mutton with combination potato is the fantastic recipe. 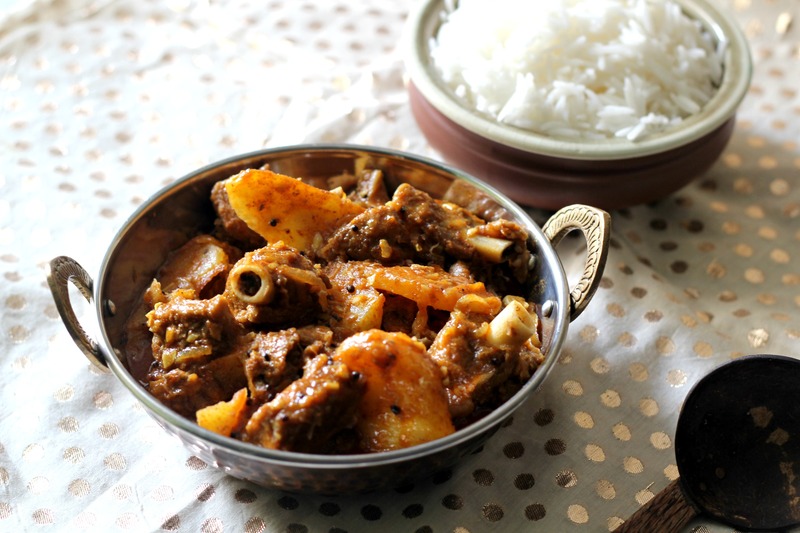 Hi Shireen, have you ever tried cooking mutton in Instant Pot. Can you please share for how long do you cook. 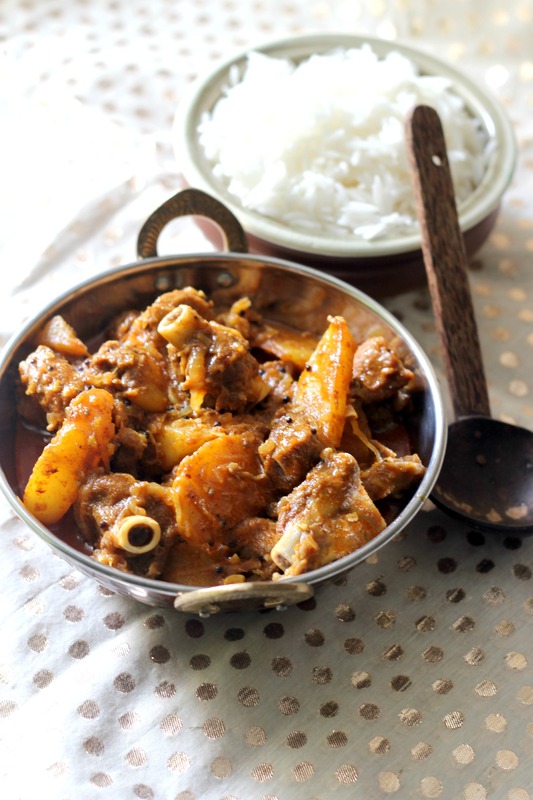 I am a vegeterian and trying to make this for my Goan husband who loves mutton. I don’t own an instant pot yet although I was very tempted to buy during the Black Friday sale. Still not convinced if I really need it or not. If I do decide to buy it, I will surely post easy mutton recipes on the blog! Decent but the fried potatoes do not absorb the masala taste. Not much, but you need to simmer the curry for 2-3 minutes after adding the potatoes. It does taste good. All your recipes are simple and superb. I learned to cook chicken varieties coz of you. Thanks a lot. 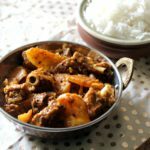 Where is white vinegar used in this curry? Hi Shireen, I like this recipe. I tried this recipe at home and my family members also like this recipe. Thanks for the kind appreciation! So glad to note that your family liked this recipe!